'A HEALTHY nation is a strong nation!' That was the sentiment permeating the air at a gathering to promote the launch of the Adopt a Clinic initiative, aimed at improving the conditions of health clinics in Jamaica and thus the overall health care provided to this island nation. The event was a call to arms, an evening of real substance, with donations being made on the night to kick-start the initiative. This landmark event was held at the Jamaican High commission under the patronage of His Excellency (HE) the High Commissioner Mr. Seth George Ramocan. Excellently chaired by Paul Harrison, Managing Director of PK Media it was well attended with 30-plus committed individuals drawn from a wide cross section of sectors including law, medical, commerce and there was also print, radio and television media representation. He further remarked that this island had given a lot to Jamaicans abroad such as Usain Bolt and Bob Marley to name a few, and that this is an opportunity to give something back. Residents of the many districts in Jamaica rely heavily on health clinics which are often under pressure from a lack of equipment and resources but are faced with increasing numbers of patients. The High Commissioner gave a passionate speech where he outlined the benefits of a strong clinic sector in Jamaica and offered his wholehearted support behind this innovative project. He pointed out that this year being the 55th year of Jamaica's independence this project will initially focus on 55 clinics and find sponsors in the UK for them. The role of the sponsor will be to spearhead a team who will raise the sum of £5000 towards the upkeep, development and improvement of these clinics. 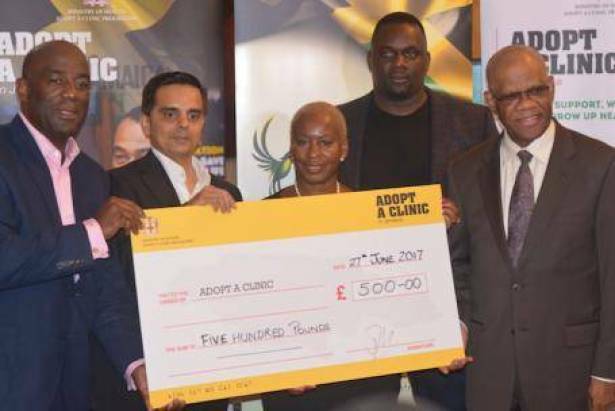 He called upon Jamaicans living in the UK and the diaspora and friends of Jamaica as a whole to get behind the project by visiting the website and making a donation to the clinic of their choice. Indeed, the choice is wide with some reported 320 clinics island wide in need of urgent repairs and financial support.